Taking a ferry from Italy to Split Croatia is your best option if you are traveling from Italian side of Adriatic coast. Two major departure ports from Italy to Croatia are Ancona and Pescara. Getting from Italy to Split is only possible from Ancona. There are only two companies which keep regular connections to Split. Below I’ll give you an overview of these companies and their timetables and schedules, and some other tips about traveling from Italy to Split via ferry. Quick jump to Ferry Companies: Jadrolinija, SNAV, BlueLine, or see Schedule & Pricing. The only international ferry connection to Split is from Ancona, Italy. There are two companies running this ferry route, Jadrolinija and SNAV. There used to be a third company, Blue Line International, but unfortunately since March 2017 they are no longer available. You can read more about this sad news here. Quick tip: You may notice it mentioned often, so it’s useful to know that Italian name for Split is Spalato. Jadrolinija is Croatian state ferry companies operating hundreds of routes. They are also the only maritime company with all-year round connections between Ancona and Split. October 29th to March 31st: Sunday and Wednesday at 20:00h (arriving Monday and Thursday at 07:00). April 2nd to October 27th: Sunday, Tuesday and Thursday at 20:00h (arrival on Mondays, Wednesdays and Fridays at 07:00h). June 28th to August 27th: Saturday and Sunday at 14:30 and 21:30, Tuesday and Thursday on 20:00 (arrivals at 9:45h and 7:00h respectively). High season line in August stops in Stari Grad on Hvar island as well. Customs check is in Split port. October 29th to March 31st: Tuesdays and Fridays on 19:45 (arrives Wednesday and Saturday 07:00). June 28th to August 27th: Monday, Wednesday and Friday at 19:45, Saturday 23:59, Sunday 11:00. It takes about 9 hours for Jadrolinija’s ferry to arrive from Ancona to Split or vice versa. SNAV company only runs ferries to and from Ancona and Split. SNAV’s high-speed jets are no longer running this route, so this trip will also take 9 hours. 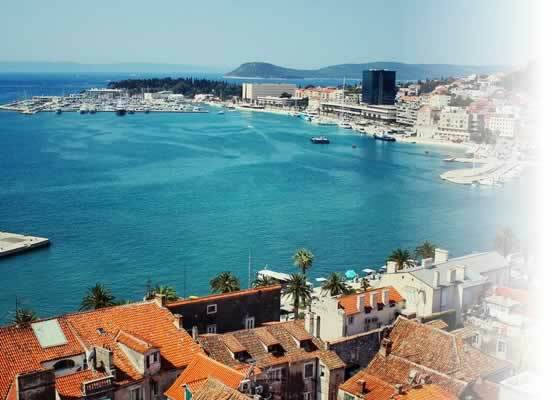 In July and August SNAV’s ferry on certain days will also go via Hvar island’s Stari Grad port. In other months ferry runs directly to and from Split and Ancona. August 13th to 31st – Monday, Tuesday, Wednesday, Thursday, Sunday on 11:00 (arrival 8 PM). Ancona – Stari Grad – Split connection departures every Friday 10 PM in July and August. Split – Stari Grad – Ancona line departures every Saturday in July and August on 8 PM. In addition to Split and Ancona, SNAV also connects Italian Pescara with Croatian Hvar island, and Bol (Brac island) and Vela Luka (Korcula island). BlueLine used to connect Split and Ancona from March until October, but since 2017 BlueLine International is no longer in business. You can read more about why BlueLine canceled their Split to Ancona ferry here. Read my Split ferry port guide to learn how to find international ferry pier for all arrivals and departures from/to Italy. For your convenience you can check all Italy to Croatia ferry connections below. You can also see availability, compare prices, and book your ferry in advance. Split has frequent and convenient connections with Italy, even though it’s only from one port – Ancona. Taking a ferry is still probably the easiest way to get from Italy to Split. Need even more info? See all my guides for ferry travel in Croatia, or find other Italy to Croatia ferry lines and schedules.